Jen did the last challenge in March 2017 and lost 5.9kg in just four weeks - even with a Vietnam holiday in between! Find out why she is doing it again, and get a taste of one of her new go-to snacks. I first found out about the program from a friend who was on Clean & Lean. The more I read about it, the more I wanted to give it a try as it was not a temporary quick-fix program, but rather it was simply about getting back to clean, nutritious foods. I was nervous in the beginning to be honest. Not because of the program but I was afraid of the weigh-in at the start - but I decided if I wanted results I needed to step out of my comfort zone and just go for it. I received nothing but support that first weigh-in day. I left encouraged and could not wait to start the program. I can’t tell you how happy I am that I made the decision to go for it. It’s by far the best nutritional program I have been a part of. I loved the program, and it was not as hard as I thought it would be. It’s very straight forward and once you begin to feel the effects of the program it is easy to follow. You want to keep going because of the results you are seeing. Each week the program adds on new foods so you can see if your body responds better on week 1, for example, or maybe week 3. The program is designed for everyone. You can benefit from it if you are already at your target weight and you simply want to clean up your diet and it works for those who might have more to lose. In the end, Clean and Lean is not about weight loss. It is about applying a lifestyle change regarding how you view food, and how you can control your cravings with nutritious foods to fuel you forward to your goals. The program also does not make you feel like you are being deprived of food—not at all!! The recipes given in the program are amazing and you end up realising there are so many possibilities. It is something you can carry on for life! And in the end, that is what this is about. It’s about learning how to make wise choices so our bodies can have more energy, you can feel healthier, leaner, stronger and your quality of life is improved because of the strong nutritional choices you are putting in your body! Regarding the bootcamps, they are SO much fun (as fitness should be)! They are very challenging but you can always work at your own level and the coaches will help you modify, yet you end up with a fabulous workout. I love the community, too. Everyone is there together working on becoming our best. 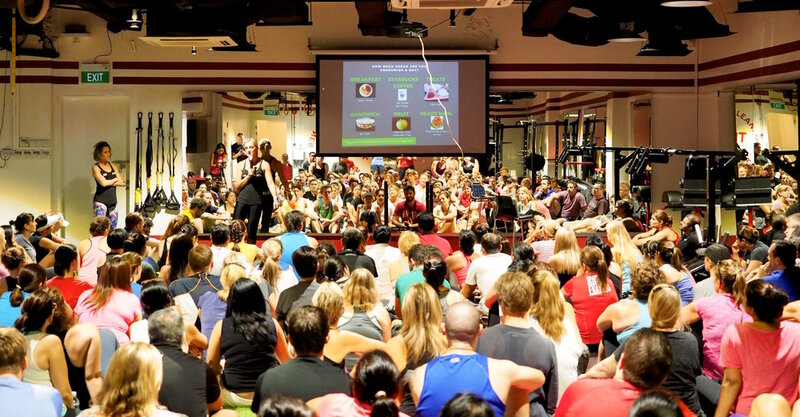 There is no competition, just a fun atmosphere full of support….and you end up with an awesome workout!! For my first Clean and Lean I lost 5.9 kg!! And this loss was including one week we were away on holiday! I was so thrilled with my weight loss, but I was also proud that I set out to do a program, and even with traveling I managed to end up with a great result. One of the biggest reasons I am coming back for Clean and Lean 15 is the amazing support I received from everyone in the program. The online groups are very encouraging. We are all on there together, and we all have the same cravings and weaknesses at times and can relate to one another to help each other stay strong. I also wanted to join the next round because of the results that I received. I am so motivated to get started on the next one! For this year my goals are to continue with each Clean & Lean Challenge for the year in hopes of dropping another 15 kg! It’s not going to happen overnight, but with consistency, a strong diet, an active lifestyle and a positive attitude, I truly believe I will reach my goal. I cannot wait to see what this year holds! How do you snack now when you're hungry? This is one of my favourite snacks from the UFIT Clean & Lean cookbook. The recipe is super easy and so helpful when on Clean & Lean! Let the UFIT Clean & Lean Challenge put you on the path to a healthier you for the rest of your life. In just four weeks, under the guidance of our qualified nutritionists you will cleanse your body of sugars and processed foods and be introduced to delicious, clean food that is actually good for you. Along the way you'll meet a supportive community and share experiences, recipes and tips as you embark on your journeys together.